When Alex Riel had his 70th birthday in September 2010, the legendary Copenhagen jazz club, Jazzhus Montmartre, decided to celebrate the occasion since it was here that Riel began his career in the early 1960s. The celebration lasted for more than a week, where the man of the hour was presented in a number of constellations that included Palle Mikkelborg, Annisette, Marilyn Mazur, Santa Cruz and Hanne Boel, among others. To round out the festivities, Alex Riel chose three of his favourite musicians to form a band for the occasion. The quartet primarily played jazz standards, including well-known numbers by Dexter Gordon, Bill Evans and John Coltrane. The combination of these four jazz giants turned out to be "a match made in heaven" and luckily the result was documented in a recording. The audience went wild and was left wondering how there could still be so much pep in the birthday boy after ten days of concerts in a row! The concert was also reviewed by the Copenhagen daily, Berlingske Tidende, where it received a practically unheard-of six-out-of-six stars. Over the course of five decades, Alex Riel has played with the greatest names in jazz and made an international name for himself as one of the world’s most prominent drummers. Both at home and abroad he is considered a bit of a living legend. One thing many people notice when they hear Alex today is that, in spite of his age, he still performs with an unbelievable amount of playfulness, presence and talent for improvisation, and never falls into a routine. In addition, his drumming is characterized by being particularly melodic, whether it be a fiery drum solo or a subdued display of brushwork. Together, Jesper Lundgaard and Alex Riel comprise one of the best and most congruous bass/drums teams that Europe has to offer. Lundgaard’s big sound and distinctly rhythmical, melodic and creative bass playing make him a particularly deserving successor to Niels-Henning Ørsted Pedersen, and Riel has never concealed the fact that Jesper Lundgaard is among his absolutely favourite bassists. Today alto saxophonist George Robert is a resident of Switzerland where among other things he teaches at the music conservatory in Lausanne. Previous to that he lived in the US where he established a successful career that included collaborations with Chick Corea, Bobby McFerrin, George Benson, Diana Krall, Phil Woods, Ray Brown and Phil Collins. Anyone who hears Robert play can’t help being impressed by his obvious mastery of his instrument. He is a phenomenal musician who lives to play jazz and on a number of occasions has spoken of how much he enjoys playing with Alex Riel in particular. The two have also toured Europe with Robert’s quartet. Dado Moroni from Italy is an extremely prominent name in his homeland as well as the rest of Europe, and has also achieved much recognition in the United States as a terrific pianist. This has not least of all to do with his collaboration with legendary bass player Ray Brown, but also other stars like trumpet player Freddie Hubbard and fellow pianists Oscar Peterson and Ahmad Jamal. Dado Moroni plays with extreme intensity and is always capable of lighting a fire under his fellow musicians onstage. Several times during the concert at Jazzhus Montmartre he actually lifted the several-hundred-kilo grand piano with his one knee while playing – just to give you an idea of the power behind his performance! GET RIEL is a studio recording with American pianist Kenny Werner, French bass player Pierre Boussaguet and Danish veteran drummer Alex Riel. It was made on a Friday afternoon in Copenhagen - because that’s all there was time for! Bandleader Alex Riel had already played with both Werner and Boussaguet on several occasions, but the three of them had never before played together in this configuration. Nor did they have any rehearsals or make any plans for the recording, other than each of them brought suggestions for tunes to play. The result is a highly intense recording that takes us through a universe of spell-binding interpretations of five originals, two standards and even a classical piece by Borodin. All first-takes. Alex Riel’s own solo piece ”Mosquito” is a little melodic gem into drumming. A very unique recording, maybe even one of Riel’s best to date, that demonstrates what can happen when skilful artists meet and the chemistry and atmosphere is just right! 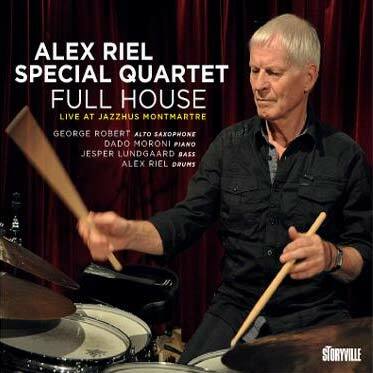 RIEL TIME is a live recording from Copenhagen Jazzhouse with one of bandleader Alex Riel’s favourite line-ups over time: American heavy-weights Jerry Bergonzi (tenor sax) and Kenny Werner (piano), and Danish ditto Jesper Lundgaard (bass) and Alex Riel (drums). With this recording we are witnessing a musical explosion from four musicians with an obvious phenomenal interplay. It gives way to their brilliant musicality when each of them pricks up their ears and throw themselves fearlessly into any challenge their co-players may offer them. It’s energized and spell-binding, and you can hear that they love it as much as their audience! ALEX RIEL TRIO WHAT HAPPENED?